Coleus plant, also known as Painted Nettle, is often grown outdoors as an annual because it is frost-tender. But it's easy to grow indoors if you can provide bright light. Distinctive leaf shapes, intricate patterns, and rich colors rival some of the showiest foliage plants. Pinch your plant. Coleus plants can get leggy. Pinch growing tips often to encourage them to branch out and stay bushy and full. Also pinch off flower spikes as soon as you notice them because they will detract from the beautiful foliage. Keep it moist. Coleus leaves will wilt and may fall off if the soil is too dry. 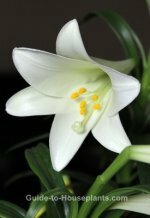 You'll have a much healthier-looking plant if you keep the soil moist at all times. Use a pot with drainage holes and water thoroughly. Need a container? Check out the stylish self-watering pots available now. It's just the thing to keep your coleus from wilting this summer. Dropped leaves? Low light, dry soil or cold air can cause leaves to drop. Don't worry -- this vigorous plant will replace them when it gets what it wants. Something bugging your plant? Aphids like to attack new growth. Treat your plant right away and isolate it to avoid contaminating your other plants. 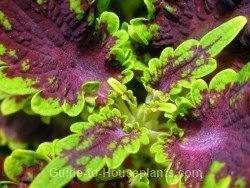 Boundless varieties of coleus are available. Foliage colors include red, maroon, brown, cream, yellow, orange and green in dramatic combinations and designs. Leaf edges may be scalloped or ruffled and have a contrasting color. Stunning new hybrids make choosing just one nearly impossible. Fortunately, we don't have to choose. 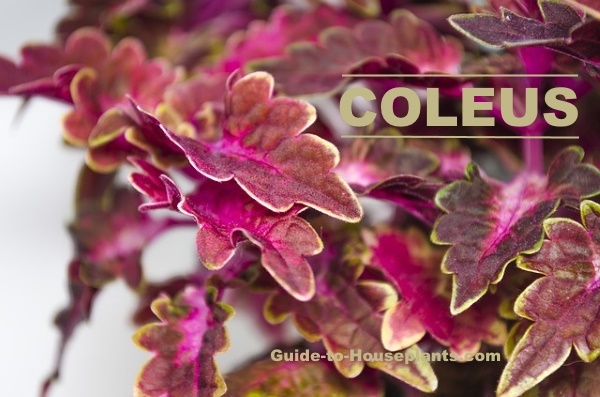 Coleus plant is easy to find in garden centers, and a cinch to grow from seed. It's also practically foolproof to propagate from a plant -- just cut off a stem and stick it in a glass of water. There's no need to over-winter them. I replace my coleus plants when they get tall and leggy. This garden favorite is inexpensive. Besides, I like to try new varieties each year. Light: Bright light. Some direct sun is okay, except intense summer sun which will scorch the leaves. Too little light dulls leaf colors and may cause leaves to drop. Water: Keep soil evenly moist. Leaves will wilt if thirsty. Avoid getting the velvety leaves wet. Hard water will cause white spots and they won't come off. Always use room-temperature water when watering houseplants. Humidity: Moderate humidity. Check out these easy ways to increase humidity for your tropical house plants. Don't mist coleus leaves because tap water will leave spots. Temperature: Average room temperatures 65-75°F/18-24°C. Leaves may wilt or fall off if the plant is exposed to temperatures below 55°F/13°C. Fertilizer: Feed every 2 weeks spring and summer with a balanced liquid fertilizer diluted by half. Propagation: Sow coleus seeds in spring. 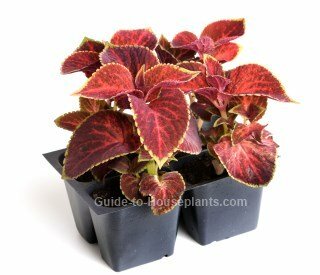 Take 3 in (7 cm) coleus stem tip cuttings in spring or summer. Stem tip cuttings root easily in water or moist soil.